Some of the founding members of WOC•Art collaborative, from left to right: Tamara Leigh, Danielle Ponder, KaeLyn Rich, Reenah Golden, Tianna Mañón, N'Jelle Gage-Thorne, Rachel McKibbens, Delores Jackson-Radney, and Rachel DeGuzman. A cavernous, lofted space on the third floor of an old industrial building at 215 Tremont Street was recently given a fresh coat of paint, and it will soon be filled with art and activity. There'll be sounds of women making plans for collaborative arts and cultural events, while children play nearby. It's an empty space now, blank with potential, but as the home base of the newly formed WOC•Art collaborative, the place will be used as an incubator for ideas and actions, from art and social-justice salons to book clubs, exhibits, performances, and other programming that the group dreams up. 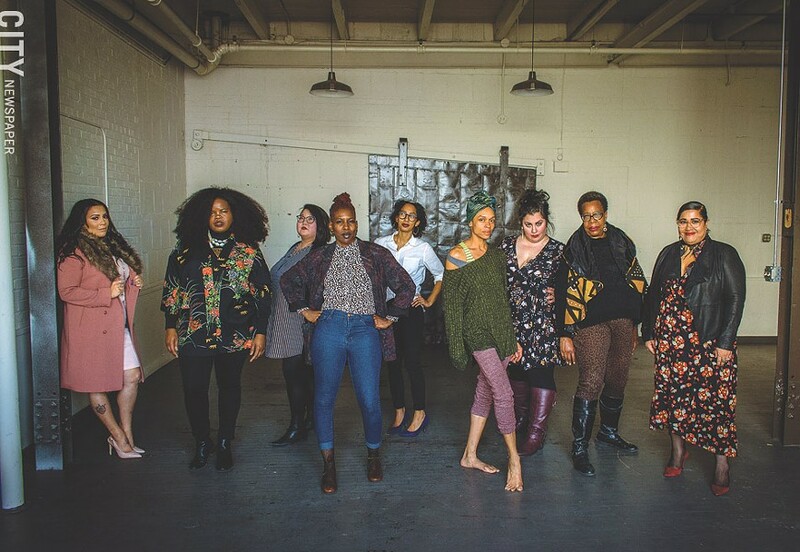 WOC•Art (pronounced "woke art") is a multi-generational, multi-racial, multi-discipline collaborative of creative women of color, says the group's founder, Rachel DeGuzman. The women are pooling the power of their individual accomplishments to support one another's endeavors and create a stronger, more visible platform for their projects. But a major reason the members formed the group is to address inequity in the arts, specifically where it concerns women of color. As artists, they are funded and exhibited far less than white men. If you visit almost any museum or gallery, the problem is evident. In politics and in the entertainment industry, women of color are gaining more visibility and power, DeGuzman says. "But where are we in the arts? Women of color are not recognized as brilliant, and not funded as brilliant." It's no secret that race- and gender-based inequity exist everywhere, including in Rochester. The problem is in every sector, but the fact that it exists in the arts is often overlooked, DeGuzman says. "But if we are to say that arts make a difference in people's lives, than equity in arts funding matters." And though Rochester keeps convening groups to address systemic issues, DeGuzman says, "the people that are experiencing marginalization are not at the table." Meanwhile, many local women of color have been doing work that helps marginalized populations, often within communities of color. They're doing it without access to a lot of funding and without being asked to join the committees that manage the resources to address inequity. WOC•Art has 11 founding members, including DeGuzman. They include artists of various cultural backgrounds and experiences and other kinds of professionals who work within marginalized cultural sectors in Rochester. Many of the women run businesses, head performing arts organizations, or provide arts and cultural programming to schools and the wider community. DeGuzman's business, 21st Century Arts, provides consulting services for artists and arts organizations. She's also developed a series called "At The Crossroads: Activating the Intersection of Art and Justice," which uses the arts to facilitate conversations about social justice. For each event, she brings together a different group of people – mostly people of color – to co-create the programming and discussions, which tackle intersecting issues of racism, sexism, transphobia, poverty, and other factors of inequality. Most of the founding members of WOC•Art have participated in the series in one way or another, and some have collaborated with one another in the past. Founding member Rachel McKibbens is an internationally-acclaimed poet and visual artist and the founder of the annual Pink Door Writing Retreat, which since 2012 has created space exclusively for femme, trans, and gender variant writers of color. 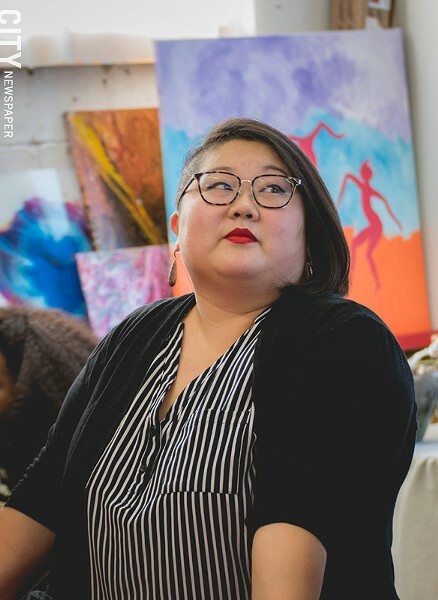 She's also the co-owner of The Spirit Room, a downtown cocktail bar that regularly hosts musical performances and literary readings, which she makes sure is a profoundly safe space for marginalized artists and customers alike. Digital media artist W. Michelle Harris is an associate professor at RIT and has created visuals to accompany music and dance performances, notably with Rochester dance company BIODANCE. Choreographer and dancer N'Jelle Gage-Thorne is co-founder and president of FuturPointe Dance and has performed on international stages. Musician and attorney Danielle Ponder performs internationally with her group Danielle Ponder & The Tomorrow People, and themes of social justice in her music are drawn from her experience as a public defender. She's also engaged with many community initiatives, including sitting on the board of Teen Empowerment. 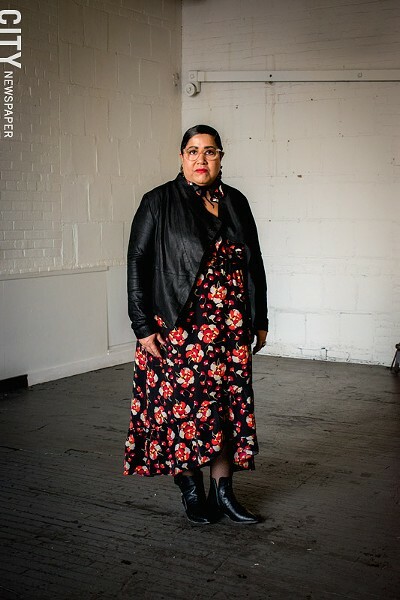 Nydia Padilla-Rodriguez is artistic director and co-founder of Borinquen Dance Theatre and is an administrator with the Rochester City School District. 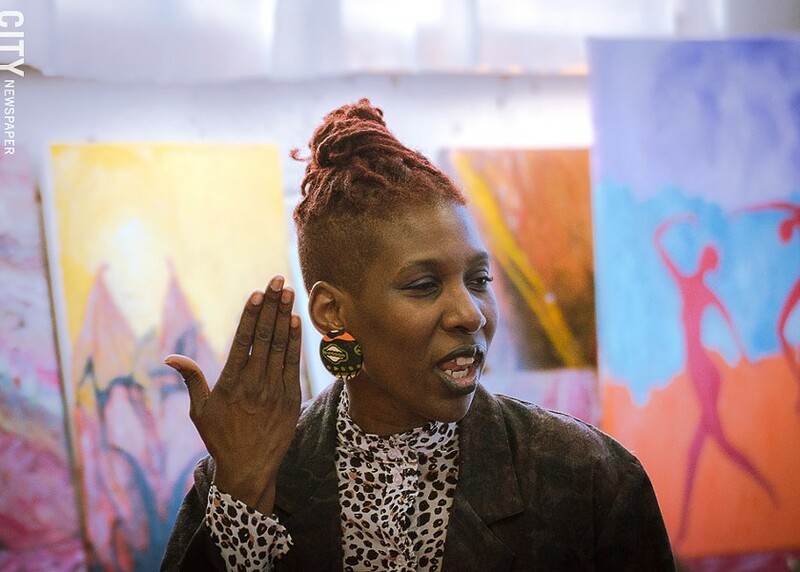 Delores Jackson-Radney is an actor, director, art historian, educator, writer, curator, and founding partner of Kuumba Consultants, which provides arts and cultural programming for schools and youth organizations. Also a founding partner of Kuumba Consultants, Reenah Golden is a writer, performer, educator, and founder of The Avenue Blackbox Theatre. In her role as artistic director of The Avenue, she emphasizes the voices, concerns, and art of marginalized people. Golden spends a lot of time writing grants to support programming at the theater. 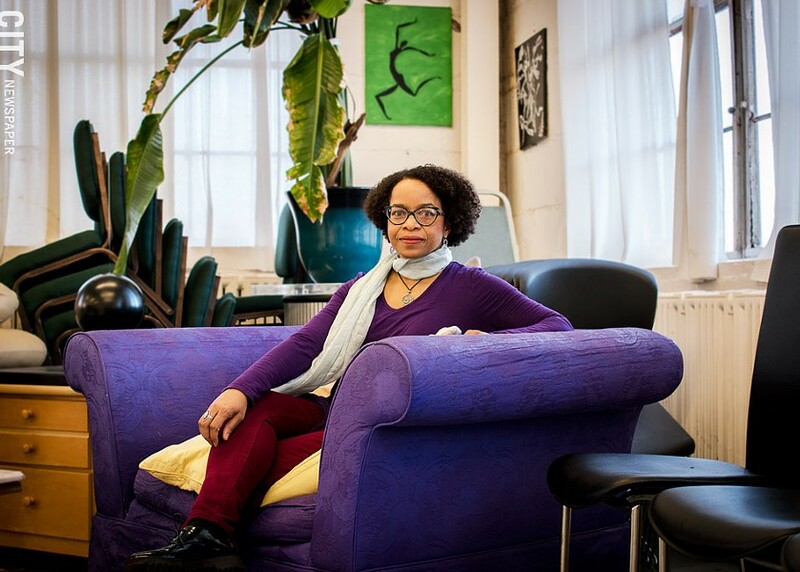 She not only brings community theater to the Joseph Avenue space, where she presents plays and other performances by artists of color, but she also offers free access to those performances to people who live in the neighborhood. "Their address makes them a member of the theater," she says. The Avenue offers free access to shows and acting classes for children as well. Some members of the group aren't visual or performing artists in the traditional sense, but engage with issues of social justice through their work. Multimedia journalist Tianna Mañón covers the complexity of local political decisions in her work as the editor in chief of Open Mic Rochester and in her work as a journalist for WXXI and CITY Newspaper. Writer and educator KaeLyn Rich is assistant advocacy director for New York Civil Liberties Union, writes a column for Autostraddle.org, an indie queer and non-binary publication, and is the author of "Girls Resist! A Guide to Activism, Leadership, and Starting a Revolution." The book is a practical field guide for activism geared toward young girls and femmes, and includes important information on being a good ally. Author and radio host Tamara Leigh is the director of communications at Out Alliance. She's the editor of its publication, The Empty Closet, and she co-chairs the annual Rochester Black Pride festival. She was also a co-organizer of a march in downtown Rochester after Trayvon Martin was killed. Leigh says that when Trayvon's mother Sybrina Fulton spoke at the University of Rochester, she told the audience that Rochester's march helped to get the case national attention and pressure the FBI to press charges against her son's shooter, George Zimmerman. One of the strengths of a collaborative is increasing visibility, Leigh says of WOC•Art. "Many voices together certainly carry so much more weight than any one alone," she says. As editor of The Empty Closet, Leigh says she can assist with visibility. The publication can be a vehicle to help WOC•Art advocate for women and femmes of color in the arts community, and for that community to have a way to express itself. WOC•Art can help set the tone for creating equality in Rochester, Leigh says. "I don't know that there's been a group before that could champion for women of color in the arts specifically," she says. "And I'm excited, based on all of our different journeys and voices and areas of expertise, to be able to do that in a cohesive way." WOC•Art's space is adjacent to Ralph Thompson's Gallery Seventy-Four, where for more than a year DeGuzman has held most of the "At the Crossroads" events. The wide-open space measures between 700 and 800 square feet and has a kitchen and an accessible bathroom, and the building has a wheelchair-accessible ramp and elevator. Collective members will have use of Thompson's 2,700 square-foot gallery space for performances, rehearsals, creation, and exhibitions for 260 days this year. The group's vision is for the loft to function as a co-work space, with some group members having regular office hours there. The collaborative will work to increase opportunities for women of color, co-promote their work, and find funding for the group's projects as well as projects put together by other women of color. "These are super creative and busy women who have carved out spaces to not just realize their dreams, but create spaces where other women, femmes, girls, and traditionally marginalized people can actualize theirs," Golden says. Golden says she sees the collaborative as a space of refuge, for creative time apart from the work they do individually. "I also see it as a way to come together and open the door, figuratively and literally, to other emerging young women who don't have a space to interact and interface with women in their field, or women like us who may have something to offer them specifically," she says. In April, Golden and DeGuzman are bringing New York-based playwright Sarita Covington to Rochester to present the world premiere of her play "Things Went Horribly Wrong" for nine performances at The Avenue. The play explores female leadership as it moves back and forth between the lives of South African anti-apartheid activist Winnie Mandela and a 14-year-old girl from New York City's Lower East Side. In April of 2018, four actors did a live reading of the play streamed via Skype from Covington's home as part of an "At The Crossroads" event held at Gallery Seventy-Four. The play is one of the first events that members of WOC•Art will present. Golden will direct the play, and DeGuzman is organizing a Long Table Conversation to accompany each performance. Harris has been tapped to create multimedia visuals. WOC•Art will use 2019 as a year of research and development. In the meantime, they've launched a crowdfunding campaign to help with the first year of rent as the group finds its footing. It's important to take time and create space for deciding exactly what the group wants to accomplish, Golden says. "That part feels really positive." WOC•Art will host open houses on Thursday, March 7, 6 to 9 p.m., and Saturday, March 23, 1 to 4 p.m. More information and other WOC•Art members' upcoming events are available on facebook.com/WOCArt585.